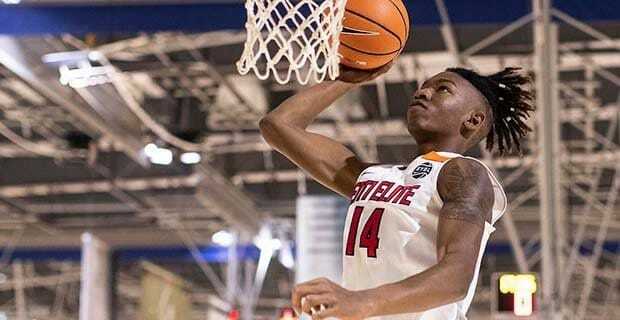 One of the most-followed Gator recruitments of the last few years by eager fans has been the pursuit of Orlando product CJ Walker, a versatile wing who just shaved down his top 12 schools to a neat final five including Florida, Arizona, Miami, LSU, and Oregon. 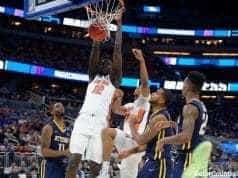 If you have been following Walker from the beginning you will know he was offered relatively early by the Gators before he was a marquee prospect and Walker quickly rose to a consensus top-100 player and now is a five-star athlete garnering the attention of NBA scouts. His prominence may have peaked at the Nike Peach Jam where his do-it-all style of play won over the hearts of everyone watching. Suffocating opponents in the press and denying the ball from getting to his man in the half court he was a defensive monster, and on offense his ability to get an offensive rebound and finish strong made him a nearly impossible matchup. Off the court, this summer saw Walker started a blog with USA Today giving people a glimpse into his world. Amidst a flurry of interviews he’s been doing since he announced his final schools, Walker was gracious to give me the chance to ask him a few questions about his rise this past grassroots basketball season. EF: Thanks so much for doing this CJ, you just announced your final five schools and I know you’re incredibly busy. Thanks so much for doing this. When we last talked, you were a player who was rising quickly and had just broken most people’s top 100. Now, you’ve exploded even more to be in the five-star discussion! How does that feel and how did that happen? CW: It feels good that I’m in the conversation of a five star to be honest, that’s one of my personal goals this year. Once I changed my work ethic and my approach to the game then it reflected in my game on the court. EF: Talking about your work ethic and approach to your game changing, does that mean it was exclusively your game improving that lead to you blowing up or do you think you were being slept on at all by recruiting analysts? CW: No, my work ethic at the time reflected my inconsistency on the court. I now know you can’t cheat hard work. EF: I think “you can’t cheat hard work” belongs on a poster somewhere. Your summer basketball career is now over. Can you reflect on what your time was like playing grassroots basketball these last few summers? CW: It was a rollercoaster. I had some dark days, especially the last two summers trying to find myself and the right fit, it was tough for me but it prepared me for this past summer. I was able to enjoy this AAU season and play for a program that believed in me 100% but held me accountable every time I put on an E1T1 jersey. EF: It definitely looked like you were comfortable out there and I’m glad you found a great home there. In some interviews you have mentioned your desire to go one-and-done to the NBA. What do you think you need to accomplish personally to make that goal happen and what role will your college team and coaches play in helping you reach that goal? CW: Yes, E1T1 is a brotherhood. Yes, I have a goal for myself and Coach Marcus and my parents are preparing me for that goal. I want to come in and play right away, make an impact on the defensive end first and then offense second but I want my future coach to be able to work with me through my mistakes, not just bury me on the bench. EF: Is there an NBA team you’d most like to play for? CW: (laughs) whoever believes in me to be honest. EF: It was a crazy rule change. I’m sure it will be abused by someone (laughs). 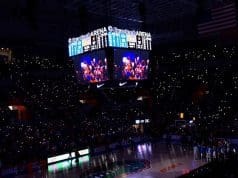 Keith Stone gave a quick pitch to you on Twitter the other day to come to Florida (while also suggesting the Gators need to bring back Midnight Madness which is definitely true). 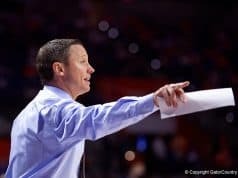 Being a Florida local, do you have a relationship with Keith or any of the other Gators. CW: Yeah, Keith is always checking on me making sure I’m good… and yeah I heard Midnight Madness is lit, I saw YouTube videos. EF: How did the opportunity to write a blog with USA Today come about and what do you hope to accomplish with it? CW: They reached out and said I earned a blog. The just wanted want the fans to get to know me outside of the court. EF: It will be back someday I’m sure! Thanks so much for doing this CJ, I know this is a busy time for you. Have a great rest of your summer and I’ll be sure to stay in touch! CW: Thanks again for reaching out I appreciate this.